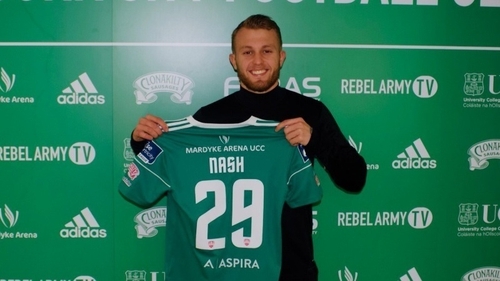 Cork City have boosted the ranks with the signing of English striker Liam Nash ahead of the new Airtricity League Premier Division campaign. Nash, 23, joined League One Gillingham in 2017 and has had most recently been on loan at non-league Concord Rangers. "It’s brilliant to get finally get it over the line and I am very excited for this new chapter. It is a new challenge and I can’t wait to get going. "The lads are great, the staff are great and we are looked after very well here. The training is good, the tempo, the intensity… and I am really looking forward to getting my head down and getting some games. "I feel fit and ready to go, and hopefully, when I get the opportunity, I will take it with both hands. I want to get myself back out there, my confidence, scoring goals and working hard. I just want to give everything on match day and hopefully progress and get some goals." Cork boss John Caulfield welcomed the news, saying: "We are very happy to have Liam coming in. it has been ongoing for a few weeks, so we are delighted that everything is now resolved and Liam can officially sign. Liam has been in with us for a few weeks and he done has very well. He is a very good finisher and we are happy to have him in." Caulfield also confirmed that John Kavanagh has moved to Finn Harps on loan until the summer, stating: "Kav has returned to Finn Harps on loan. "He had a very good second half of the season there last year, and it is a chance for him to continue playing regularly. Harps were very happy with him, so this move is a good fit for all parties."